the Del Monte Forest. 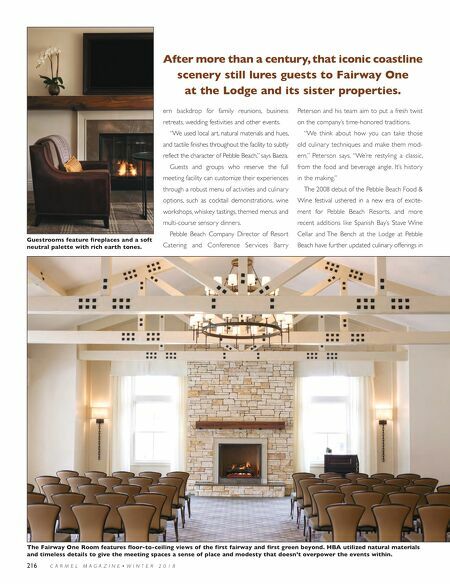 Fairway One guests are just a short walk from The Bench, which serves salads, starters and wood-fired mains in an airy dining room overlooking the 18th hole of Pebble Beach Golf Links. The neighboring Tap Room has long been a favorite of golfers, resort guests and local residents looking for steaks, burgers, beers and spirits—plus decadent treats like the towering coconut cake. 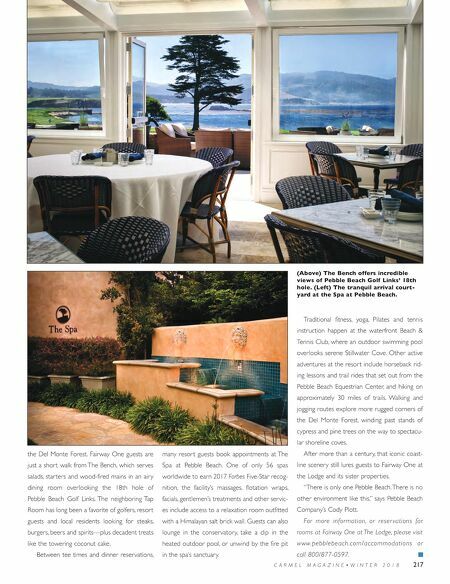 Between tee times and dinner reservations, many resort guests book appointments at The Spa at Pebble Beach. One of only 56 spas worldwide to earn 2017 Forbes Five-Star recog- nition, the facility's massages, flotation wraps, facials, gentlemen's treatments and other servic- es include access to a relaxation room outfitted with a Himalayan salt brick wall. Guests can also lounge in the conservatory, take a dip in the heated outdoor pool, or unwind by the fire pit in the spa's sanctuary. Traditional fitness, yoga, Pilates and tennis instruction happen at the waterfront Beach & Tennis Club, where an outdoor swimming pool overlooks serene Stillwater Cove. Other active adventures at the resort include horseback rid- ing lessons and trail rides that set out from the Pebble Beach Equestrian Center, and hiking on approximately 30 miles of trails. Walking and jogging routes explore more rugged corners of the Del Monte Forest, winding past stands of cypress and pine trees on the way to spectacu- lar shoreline coves. After more than a century, that iconic coast- line scenery still lures guests to Fairway One at the Lodge and its sister properties. "There is only one Pebble Beach. There is no other environment like this," says Pebble Beach Company's Cody Plott. For more information, or reser vations for rooms at Fairway One at The Lodge, please visit www.pebblebeach.com/accommodations or call 800/877-0597. C A R M E L M A G A Z I N E • W I N T E R 2 0 1 8 217 (Above) The Bench offers incredible views of Pebble Beach Golf Links' 18th hole. (Left) The tranquil arrival court- yard at the Spa at Pebble Beach.